Migrating or cloning a VPS from one provider to another can be challenging and time-consuming. Although it can be a great opportunity to verify that your backup restoration process works, sometimes it’s not worth the effort. In this tutorial, we’ll use snapshots and recovery mode to migrate a VPS between providers. 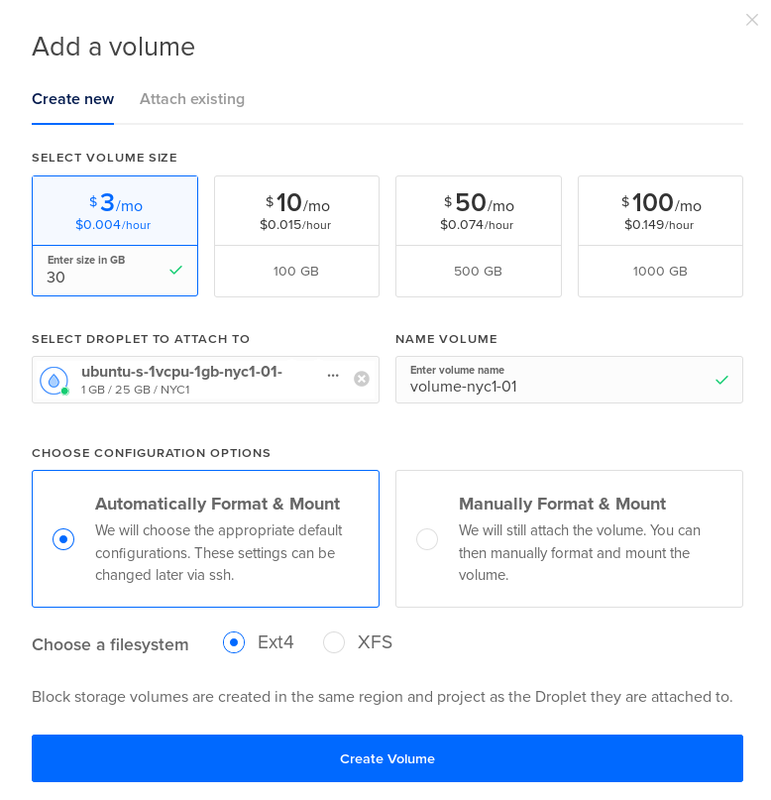 Specifically, we’ll clone a DigitalOcean VPS onto Vultr and LunaNode, and I’ll provide tips for adapting the process to migrations from Vultr or from LunaNode. That said, these steps will work as long as both providers use full virtualization, the source provider offers a recovery mode or allows you to boot to an ISO, and the destination provider supports uploading custom images. The overall process will look like this: we’ll snapshot a DigitalOcean VPS, create a new VPS from the snapshot, and boot the new VPS to the Recovery ISO. From Recovery ISO, we’ll copy the disk contents to a raw or qcow2 image stored on a block storage device, and install a webserver. Finally, we’ll tell Vultr and LunaNode to download the image. Before we get started, just a few tips for adapting this process for migrating from other providers. 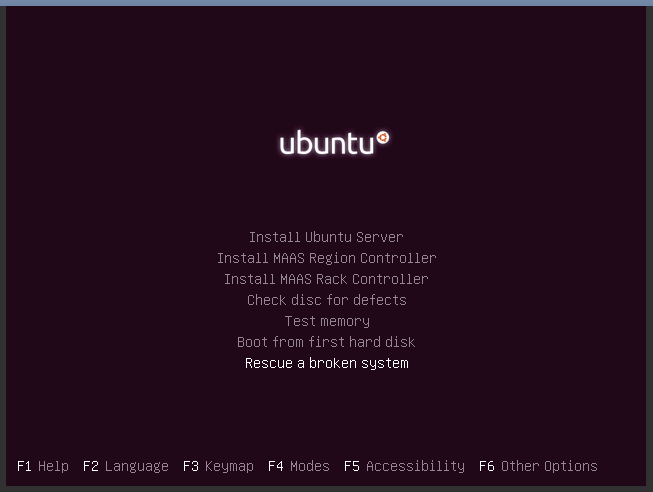 If you’re migrating from Vultr, instead of “Recovery ISO”, use the Ubuntu 16.04 Custom ISO, and select the Rescue Broken System option after the VPS boots to the ISO. If you’re migrating from LunaNode, you’re in luck, because they make the process really easy! Just snapshot your VPS, download the snapshot from their control panel, and upload it to the new provider. 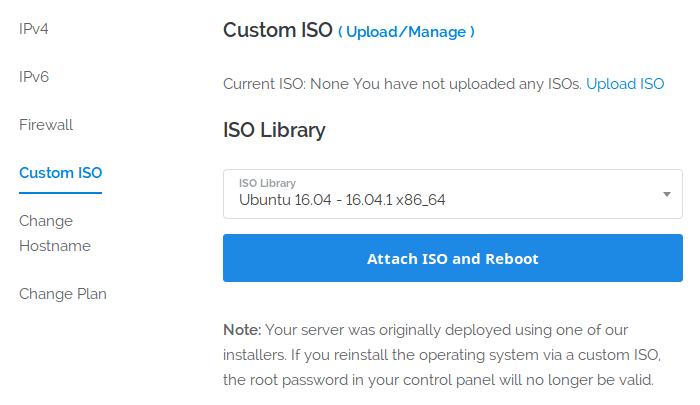 Lastly, if your provider supports a recovery ISO but not snapshots, you can skip the snapshot step and start by booting to the ISO, it just means that the process will require downtime on the source VPS. First, we’ll snapshot the DigitalOcean VPS, create a new server from the snapshot, attach some block storage, and boot to the Recovery ISO. Once the snapshot completes, deploy a new VPS from the snapshot. 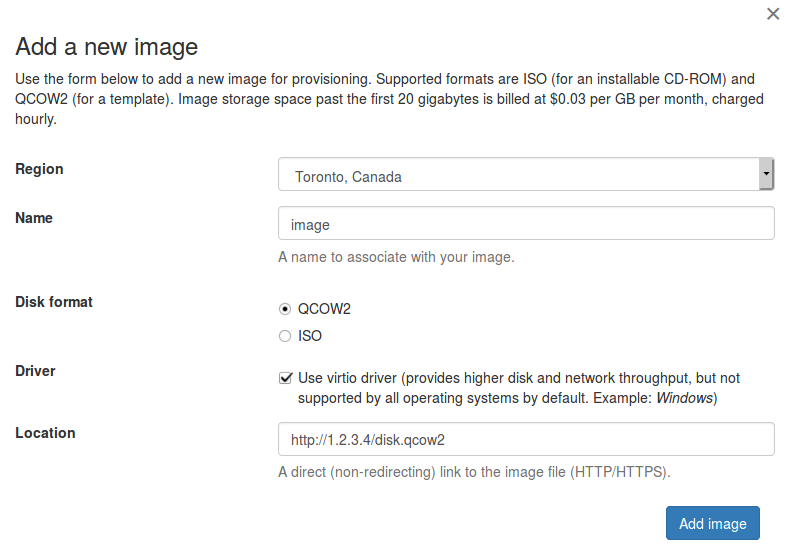 When creating the new VPS, be sure to select the snapshot you just took. 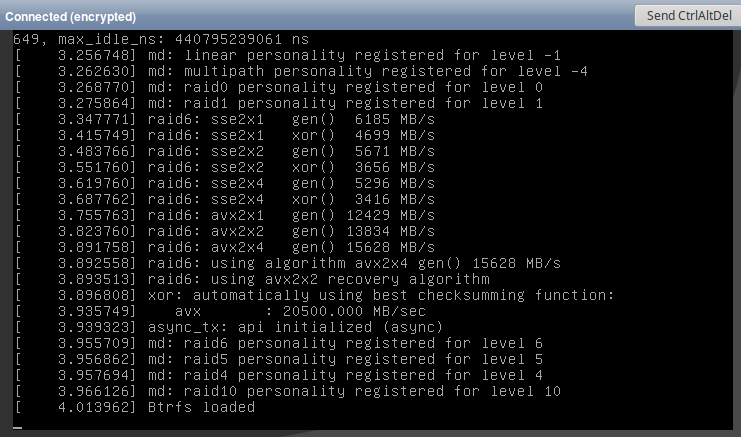 Finally, select the new VPS again, head to Recovery, and select Boot from Recovery ISO. Shutoff your VPS and boot it back up from the panel. 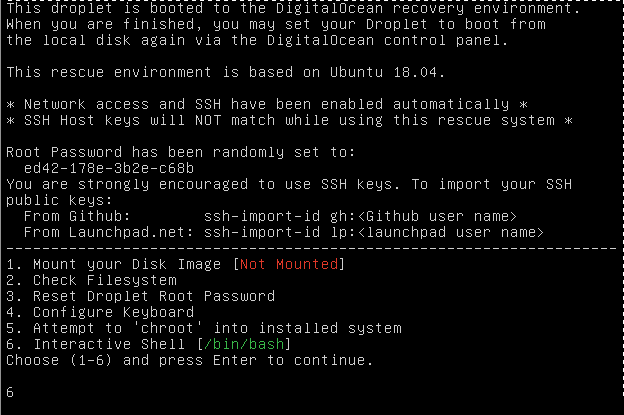 Open up the VPS console, and type 6 and press enter to start an interactive shell in the recovery ISO. Now, we’ll use the recovery ISO to copy our disk into an image file on the block storage volume. /dev/vda contains our root disk, which we want to copy to the new provider. /dev/sda is the block storage device that we’re using as a temporary storage location. Now, you need to decide if you want to extract a raw image or a qcow2 image. Vultr only supports adding custom raw images, and LunaNode only supports adding custom qcow2 images. Next, we’ll set up a webserver on the recovery ISO so that the new provider can grab the image. WARNING: this will expose your disk publicly. For security, you may want to rename the /mnt/disk.raw disk file to a random filename. For additional security, consider setting up SSL on the webserver so that the disk transfer is not unencrypted. You don’t need to actually download the file though, since Vultr and LunaNode only allow you to add a custom image by providing a URL. Let’s go ahead and add the image. At last, let’s deploy the new VPS — create a new VPS from the snapshot! To fix this, we need to remove the console=ttyS0 kernel parameter. This only applies if you were running Ubuntu on DigitalOcean and ran into the same boot stuck bug — if you encounter other issues, then other solutions may be needed. 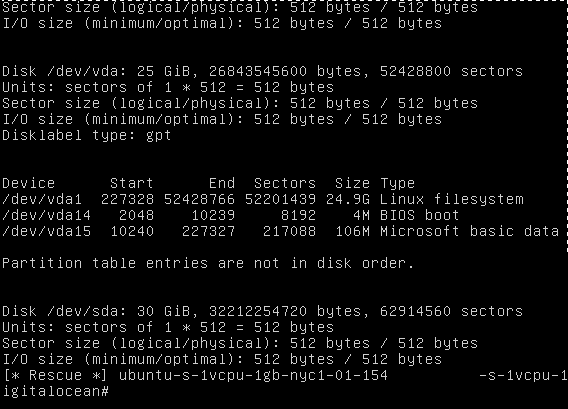 At this point, your VPS should boot! You may have to make a few other configuration changes to get networking online. Snapshots are a great way to quickly migrate a VPS. 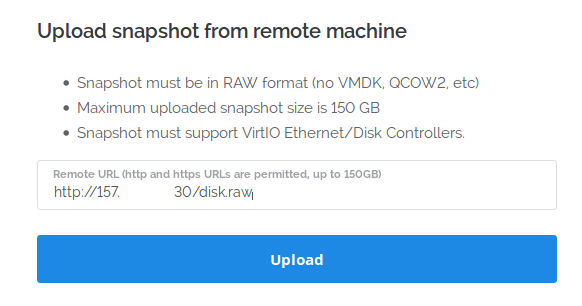 Unfortunately, a few providers like DigitalOcean and Vultr do not allow you to download snapshots, making their snapshots useless for cloning a VPS onto a different provider. However, we can nevertheless use Recovery or Custom ISO features to extract the disk state of a VPS as a raw or qcow2 image, and send that image over to the other provider. The process isn’t completely painless, but still relatively straightforward, and pretty quick once you get the hang of it.